Figure 1. 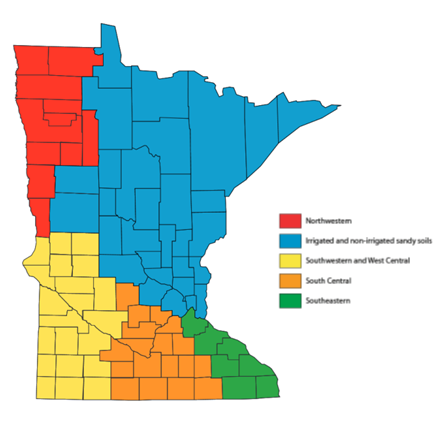 Best Management Practices (BMPs) regions of Minnesota. The key factor for fall applications is the probability for N loss due to soil and weather conditions. Fall N applications are not recommended in southeastern Minnesota and for sandy (coarse textured) soils (Figure 1). Substantial N loss potential makes it economically and environmentally unsustainable to apply N in the fall in the southeast because of karst subsoils and high rainfall, and in sandy soils because of high leaching potential. In the other regions of the state, fall N applications are allowed, but great caution must be taken to consider if the practice is sound for specific fields. If, for example, a soil present in the west-central region is sandy or a soil in the south central region is on karst subsoil, N should not be applied in the fall. Similarly, if a field has a history of getting flooded in the spring or if it has excessive drainage (such as intensively tiled), fall N might not be the wisest choice. For fields and regions where fall is allowed, the choice is limited to one or two N sources. In the south central region anhydrous ammonia is the only source. In southwestern, west central, and northwestern Minnesota anhydrous ammonia and urea can be used. For fall anhydrous ammonia, it is strongly suggested to use a nitrification inhibitor to help maintain N in the ammonium form as long as possible to minimize the potential for leaching or denitrification losses. The nitrification process (conversion of ammonium to nitrate) for urea, even with a nitrification inhibitor, is normally more rapid than for anhydrous ammonia. Urea applied in the fall is still included as a best management practice (BMP) because the potential for loss of that nitrate is typically low in the drier regions of the state, including southwest, west-central, and northwest Minnesota. The prevailing weather conditions (mainly temperature and precipitation) that support the use of fall urea as a BMP, are not the same we are experiencing now. In Minnesota most N loss occurs in the period April-June when there is excess precipitation and crops are not present or are too small to use most of that water. The 30-yr normal precipitation for the period April-June, when research for urea BMP’s was conducted, was drier than it has been in recent years (2011-2015), most noticeable in May and June (Table 1). The average difference (30-yr normal vs. last 5-yrs) for April-June shows an increasing gradient from the northwestern to the south central region (0.3” Red Lake Falls, 0.8” Morris, 1.0” Lamberton, and 1.5” Waseca). Table 1. 30-yr normal (1981-2010) and recent 5-yr (2011-2015) mean monthly precipitation in inches from northwestern to south central Minnesota (Red Lake Falls, Morris, Lamberton, and Waseca). Difference: indicates the last 5-yr mean is wetter (positive numbers) or drier (negative numbers) than the normal. The other driver for N loss is temperature. Warmer temperatures increase nitrification rates. In the last 5-yrs we have experienced warmer than normal monthly mean air temperatures in the fall (September-December period) (Table 2). As with precipitation, there is an increasing gradient from the northwestern to the south central region. The average difference between the normal and last 5-yrs for the September-December period is 1.4°F Red Lake Falls, 1.5°F Morris, 1.8°F Lamberton, and 1.8°F Waseca. Table 2. 30-yr normal (1981-2010) and recent 5-yr (2011-2015) mean monthly air temperatures in degree Fahrenheit from northwestern to south central Minnesota (Red Lake Falls, Morris, Lamberton, and Waseca). Difference: indicates the last 5-yr mean is warmer (positive numbers) or cooler (negative numbers) than the normal. The bottom line is that recent weather conditions suggest stronger than before that fall urea application is not currently, and has never been, a recommended practice for south central Minnesota. For the other regions, increased potential for nitrification and N loss of fall-applied urea has resulted in more instances where fall urea should have been avoided. Further, the use of nitrification inhibitors with urea has produced inconsistent results, so using an inhibitor may not be sufficient to avoid N loss. With some retailers switching away from anhydrous ammonia there will be an increased emphasis on urea use in certain areas of the state. While the use of fall urea may be tempting, all factors associated with N loss should be weighed carefully before deciding if fall urea should be used in areas where it traditionally has been considered as one of the BMPs for N.
A research project funded by the Minnesota Corn Growers Association showed consistently that fall applications of urea should not be done in south central Minnesota as they had greater nitrate loss in tile drainage. The average for 2013 to 2015 was 38% greater nitrate loss in tile drainage water compared to spring urea. While grain yield differences between time of application were inconsistent across years, fall urea had the greatest risk of a yield reduction. In 2013 fall-applied urea reduced yield by 22 bu/ac compared to the spring application. We started a new study evaluating the feasibility of fall urea applications with different application methods and the use of nitrification inhibitors. This project, funded through the Agricultural Fertilizer Research and Education Council (AFREC), will produce data for the northwestern, west central, southwestern, and south central regions. In a couple more years we hope to have a sufficiently large data set to determine whether or not fall urea continues to be a BMP for southwestern, west central, and northwestern Minnesota.